Our seventh post in a series counting down the 10 most influential books I’ve read this year – 2011. 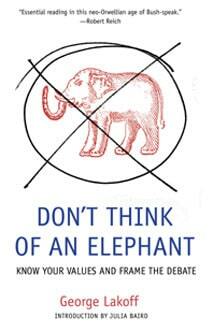 George Lakoff, Don’t Think of an Elephant, Scribe Publications, Carlton North, 2004. This is not a new book. And it is a classic. It was first published in 2004. And it essentially revolves around US politics. And, this would be a first for me – who reads about US politics? I usually don’t. Anyway, the message is profound. Particularly for the book I’m writing about manifestos. Lakoff is a linguist. He studies language and politics. In other words, how language is used to sway public opinion at the political level. “Don’t think of an elephant” is a phrase often used in Neuro-Linguistic Programming (NLP). Take a moment to reflect… What’s the first thing you think of when you hear the phrase “Don’t think of an elephant”? I bet you thought of an elephant! You’re not alone! This shows the power of language to shape the way we think about what is going on. Negative language is hard for our brains to process. All we hear is the positive. Therefore what we hear is ‘elephant’. That’s why signs like “Don’t Touch” merely encourage young children to touch. Tricky? Clever? Sneaky? It is when something is happening and you’re lost as to the reason why. It’s like being the puppet and failing to realise someone else is pulling your strings. The book specifically talks about the way the conservative governments in the US have framed the conversations about public issues. They have done so in a way that deliberately shapes how you respond. The standout example in the book for me is around the “War on Terror” – a euphemism for the US response to the attacks on the World Trade Centre of 9/11. The government’s response was to develop the “Patriots Act”. This was presented as a way to protect the US and its citizens. However, that particular title has enormous political implications. If you’re not a patriot you must be a traitor. You’re either with us or against us, right? Therefore, to cast doubt on the Patriots Act makes you a traitor! How can the opposition protest, question or challenge this? In the public’s eyes this would make them traitors! And when there is limited opposition, this gives the government in power almost total mandate to do whatever they want. This is like a linguistic version of swimming against the tide. You can’t fight the tide. You will lose. Your only alternative is to flow with it until you can move sideways to loosen its grip. Political control at a masterful level! This book may not be for everyone. You may not enjoy it. (Did you notice the negative?) And, this is powerful, powerful stuff! When I stumbled onto writing about manifestos at the start of this year I thought there was some power in what I was doing. This book confirmed it. And, that’s why it takes rung number four on my list of Top Ten Most Influential Books for 2011.